Romantic and adventurous with an emphasis on quality, enough space for everyone. Aloha Falls presents an ideal setting for a romantic honeymoon or anniversary celebration as well as a complete accommodation for your whole family (8 people or more). Aloha Falls is located in the private, upscale, and timelessly beautiful neighborhood called Reed's Island right in Hilo town. Unique to Aloha Falls is access to the waterfall and swimming area where you have so much more than just a view. The view is stunning and the waterfall sounds fill the house. The home is well cared for and the yard is manicured as a lush tropical jungle, which includes bananas, bamboo, passion fruit, and more. Here at Aloha Falls, You are in the perfect place to go to the famous Hilo farmers market and walk down our private neighborhood to all the lovely shops of Hilo. It is a 30 min drive to Volcano National Park and a 1 hr drive to the summit of Mauna Kea. Beautiful black sand beaches just across Hilo town. Botanical gardens all along the Hamakua coast are close by and a world attraction! Many past guests comment that they wish they had chosen to spend more time at Aloha Falls exploring the east side of Hawaii Island. Aloha Falls itself is a world attraction- you don't actually have to go anywhere. In fact, many guests prefer to spend their days relaxing on the lanai, tuned into the peaceful aspects of the natural tropical surroundings. Aloha Falls was built by a craftsman- custom cabinetry and close attention to detail are apparent throughout the entire home. Temperpedic style queen size beds and the lullaby of the waterfall create a superbly restFull sleep! Many guests comment on their incredible quality of sleep while staying here. Giant tile showers make bathing a luxurious experience. We welcome you to explore tropical island foods in your fully stocked kitchen. 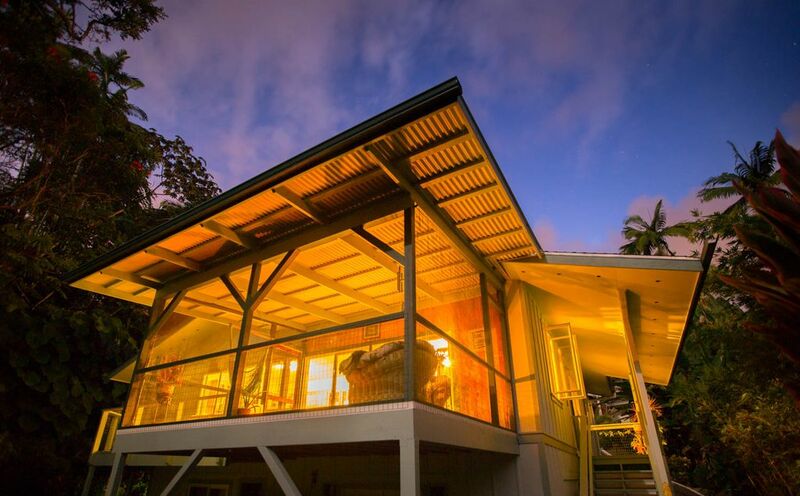 Rest all day on your sweet lanai perched above the valley and the waterfall. Explore the famous Rainbow Falls and Boiling Pots~all in walking distance. The entire neighborhood of Reed's Island is highly private and secluded surrounded by waterfalls and lush Hawaiian jungle. Reed's Island was once reserved for Hawaiian royality and the street is named after beloved Princess Kaiulani. Reserve just the upstairs for travelers with 1-4 people or expand into the downstairs "zen den" if you are traveling with the rest of your family and friends. The Zen Den provides you with an additional 2 bedrooms, both with queen size beds, a full bathroom with a deep soaking tub, and plenty of open living space. The standard rate applies for 2 guests reserving the upstairs portion of Aloha Falls. The use of the Zen Den requires an additional fee of $100+/ night depending on how many guests are in your party. Please inquire for a precise quote. Please note that the Zen Den is available for larger groups of travelers, therefore if you do not reserve it, it will be vacant, allowing for your maximum level or privacy (unless otherwise discussed at time of booking). You will be welcomed with a variety of local fruits! Indulge and love YourSelf with an on site massage. On site far infrared sauna & massage, yoga & your stay here is a Spa Retreat! You may also have your entire stay catered with local organic island foods. Be sure to inquire with Sierra about the unique on-site spa and healing services that Aloha Falls has to offer. Aloha Falls and Sierra are completely devoted to the health of the island ecosystem... As a visitor to Aloha Falls and Hawai'i in general, please begin to develop a sensitivity to resource usage.. What does this mean? This means, please conserve. Please be aware of electricity: lights, laundry, electronics; paper goods- paper towels and toilet paper; waste generation- most packaged goods recycle, but maybe you will try our local produce and contribute less the the landfill..
As a visitor to Aloha Falls you assume the responsibility of your health, safety and well being. This applies to the instances that you use the stairs, walk through the valley and swim in the water. The homeowner is responsible for upkeep of these areas, however, your safety is your ultimate responsibility. You assume all risks to use the property of 263 Kaiulani St. Hilo, HI 96720. It is steep and best accessed by slowly backing down. If you choose to walk down, do so carefully. The driveway is slippery when wet. Often leaves; palm fronds; gravel; or rocks may be on the driveway, which you need to be aware of. Walk down the driveway slowly and with awareness of the above mentioned items. The homeowner is not responsible for any injury that may occur on the driveway. These stairs are steep and slippery when wet. Use the handrails. Leaves and water make the stairs slippery. Proceed with caution. Your safety is your responsibility. The homeowner agrees to upkeep the stairs from rotten wood and decay. The valley floor is uneven. Proceed with caution. Avoid touching the jungle plants, as some of them contain allergens. There is no life guard on duty. You must be able to swim to enter the water. Children should be accompanied by an adult. You assume all risks by entering the water. Aloha! I am so honored and excited to share Aloha Falls with you. It is my dream of Hawaiian beauty and spirit. The past decade of my life has been spent nurturing the land here on the Big Island and pursuing the wisdom of various healing arts, including: massage, energy medicine, yoga, and plant medicine. My partner Troy and I focus much of our attention on creating the beauty of Aloha Falls. Hilo is the most gorgeous place in all of Hawaii! It is a sweet historic town with locally owned shops and modern comforts. The land is lush thanks to nightly rain fall. Waterfalls and black sand beaches are everywhere, along with an abundance of farms growing exotic organic produce! It was my dream to find a place in Hilo and Aloha Falls is located on the exclusive neighborhood called Reed's Island. The view and sound of the waterfall made this home absolutely perfect. Also, the attention to detail in building.. All of the furniture, cabinetry, and artwork are handcrafted and locally produced. There are feelings of simplicity, peace, and profound elegance here. Both bathrooms are equipped with natural shampoo and conditioner as well as locally made soaps. The third bathroom is located in the downstairs unit of the house, which is more of a spa center/ retreat space. However, this bathroom has a large, old fashioned cast iron tub that is just amazing to bathe in. You are welcome to have baths here, but there is an extra fee associated with it's usage. It is also available as a botanical tea infusion bath soak/spa treatment. This home sits above a pristine waterfall spring a swimming lagoon. 400+ thread count on all sheets. High quality cotton towels for shower and beach. Enjoy dining at our beautiful custom made mango table. Or on the local pine table at abuts the windows and overlooks fern-gully! Far Infrared Sauna... then waterfall cleanse!! Serene, lovely porch, close to town. Tricky getting to the waterfall but easy to view and listen too. Overall very nice accommodations. Beautiful view! Nice to swim in the waterfall. Lovely sounds from birds, frogs and waterfall. Very comfortable beds, sitting area etc. Nice large showers and enjoyed the bathing products. Well appointed. We cooked breakfast there. Enjoyed sitting on the stools and looking out over the falls to eat/drink. Driveway is steep and backup camera is very helpful, but not as bad as I had feared based on previous reviews. Very doable. Very cool vibe and well equipped. The master shower is enormous! You will experience life in the rainforest. I think your enjoyment of this VRBO will depend a lot on your expectations. The pond and waterfalls were just as pictured. The photos of the screen house at the pond and the access steps to the pond are no longer accurate - the steps no longer exist and the lower screen house is no longer safely accessible. The sauna has aged since the photos and wasn’t usable during our stay (I would guess not in the last number of months). The lower “zen den” was somewhat damp andnot as updated as the upstairs rooms, but the larger bed was new and extremely comfortable. The upstairs kitchen was very nicely updated and all the other upstairs room were adequate and as pictured. If you are expecting to stay in a quaint house in the rainforest (with all its chirping, crawling and creeping creatures) and don’t mind a short trek to access the pond, you won’t be disappointed. If you are accustomed to luxury and all the amenities, then you may end up feeling disappointed. We enjoyed swimming in the pond (despite the mosquitoes) and loved the serenity of the waterfall and the lush vegetation, proximity to downtown and quiet neighbourhood. It was a once in a lifetime experience that we will fondly remember! Mahalo for this detailed review! Yes, future renters should know that we did experience some damage from the last hurricane.. we are now using our neighbor’s beautiful trail to access the water. One plus is that we now have an awesome little beach down by the water. And also, yes, we try to represent the downstairs very accurately and charge considerably less for access to those bedrooms. They are very sweet and cozy, but not quite the same level of experience as the upstairs. However, the beds, linens, and amenities down stairs are all inclusive. You won’t be missing anything! From the moment we entered the home, we knew we were in a special place. All the amenities were provided for us. Loved the waterfall! We spent a great deal of time on the screened in lanai. The sweetest neighborhood on the Big Island- Reed's Island. ~ Previously reserved for Hawaiian Ali'i (royalty). It is surrounded by waterfalls and lush rain forest. An island on the island. Downtown yet totally private. Walk to shops, market, waterfalls, and caves. Or just rest here all day long by your own waterfall spring. Pamper yourself with spa services. The options are infinite- this is your unique experience and you deserve to have it all!! !